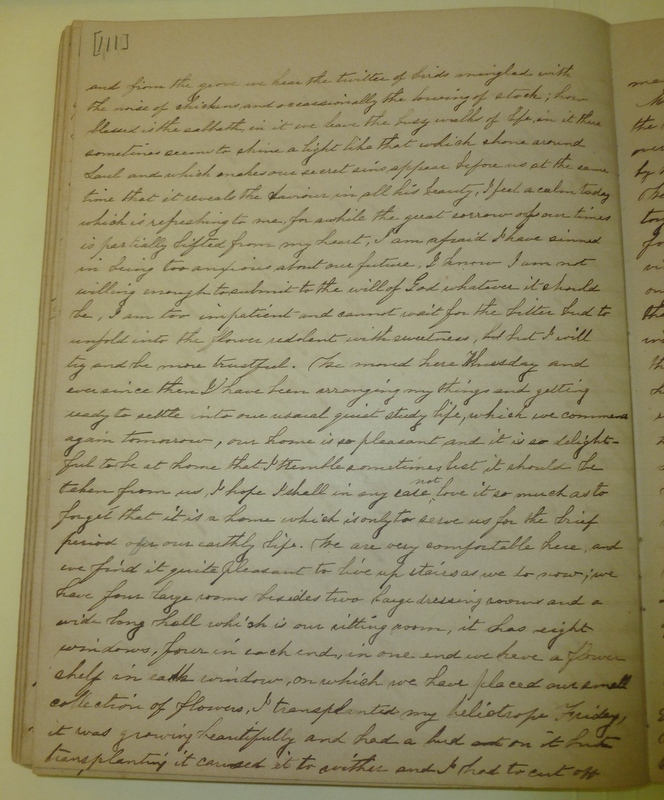 Item description: Entry, dated 18 May 1862, from the diary of Sarah Wadley. More about Sarah Lois Wadley: Sarah Lois Wadley was born in 1844 in New Hampshire, the daughter of railroad superintendent William Morrill Wadley (1813-1882) and Rebecca Barnard Everingham Wadley (1819-1905). Although born in New England, she appears to have been raised in the South, and lived with her family in homes near Amite in Tangipahoa Parish, Monroe and Oakland in Ouachita Parish, La., and near Macon, Ga. Sarah Lois Wadley died unmarried in Monroe County, Ga., in 1920. 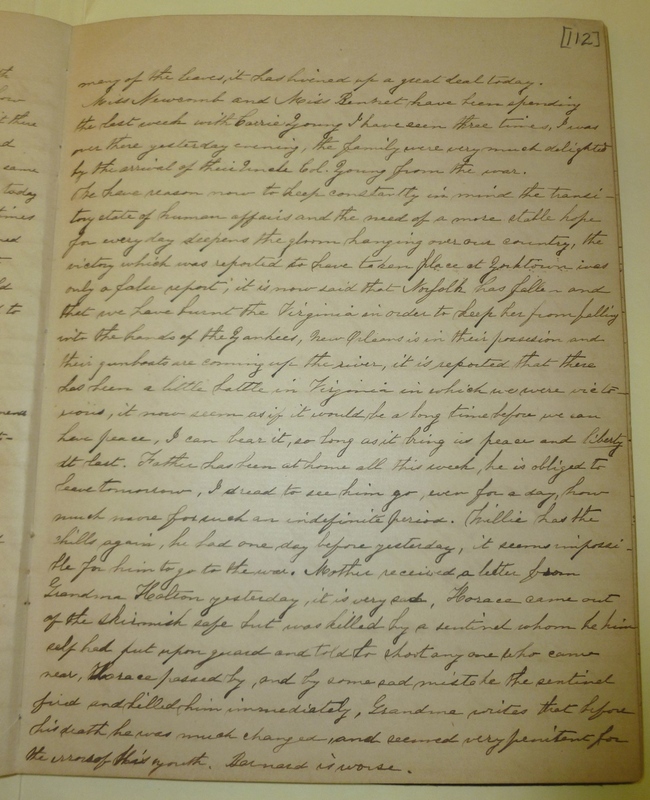 Item citation: In the Sarah Lois Wadley Papers #1258, Southern Historical Collection, The Wilson Library, University of North Carolina at Chapel Hill. Our first sabbath in our new house, how still every thing is, the sawing and hammering is hushed, and from the grove we hear the twitter of birds mingled with the noise of chickens and occassionally the lowing of stock; how blessed is the sabbath, in it we leave the busy walks of life, in it there sometimes seems to shine a light like that which shone around Saul, and which makes our secret sins appear before us at the same time that it reveals the Saviour in all his beauty. I feel a calm today which is refreshing to me, for awhile the great sorrow of our times is partially lifted from my heart. I am afraid I have sinned in being too anxious about our future. I know I am not willing enough to submit to the will of God whatever it should be. I am too impatient and cannot wait for the bitter bud to unfold into the flower redolent with sweetness, but I will try and be more trustful. We moved here Thursday, and ever since then I have been arranging my things, and getting ready to settle into our casual quiet study life, which we commence again tomorrow. Our home is so pleasant, and it is so delightful to be at home that I tremble sometimes lest it should be taken from us. I hope I shall in any case not love it so much as to forget that it is a home which is only to serve us for the brief period of our earthly life. We are very comfortable here, and we find it quite pleasant to live upstairs, as we do now; we have four large rooms, besides two large dressing rooms and a wide long hall, which is our sitting room, it has eight windows, four in each end, in one end we have a flower shelf in each window, on which we have placed our small collection of flowers. I transplanted my heliotrope Friday, it was growing beautifully and had a bud on it, but transplanting it caused it to wither, and I had to cut off many of the leaves, it has livened up a great deal today. Miss Newcomb and Miss Bennet have been spending the last week with Carrie Young, I have seen three times, I was over there yesterday evening, the family were very much delighted by the arrival of their Uncle, Col. Young, from the war. We have reason now to keep constantly in mind the transitory state of human affairs, and the need of a more stable hope for every day deepens the gloom hanging over our country. The victory which was reported to have taken place at Yorktown was only a false report, it is now said that Norfolk has Allen and that we have burnt the Virginia in order to keep her from falling into the hands of the Yankees, New Orleans is in their possession and their gunboats are coming up the river. It is reported that there has been a little battle in Virginia in which we were victorious, It now seem as if it would be a long time before we can have peace, I can bear it, so long as it bring us peace and liberty at last. Father has been at home all this week, he is obliged to leave tomorrow. I dread to see him go, even for a day, how much more for such an indefinite period. Willie has the chills again, he had one day before yesterday, it seems impossible for him to go to the war. Mother received a letter from Grandma Holton yesterday, it is very sad, Horace came out of the skirmish safe, but was killed by a sentinel whom he, himself, had put upon guard and told to shoot any one who came near. Horace passed by, and by some sad mistake the sentinel fired, and killed him immediately. Grandma writes that before his death he was much changed, and seemed very penitent for the errors of his youth. Bernard is worse. This entry was posted in Southern Historical Collection and tagged diaries, home front, Louisiana, Oakland, Sarah Wadley, women. Bookmark the permalink.